It is obvious by now that we believe whole heartedly that nutrition is a critical component towards a pets’ quality and longevity of life. I want to be clear that, while I do not work for a pet food company, I have chosen to carry specific brands in our hospital that reflect the ethics, philosophies and priorities that we ourselves uphold when it comes to pet nutrition. I would like to take the time in this blog to help all of our readers assess their own pet food choice. I will address how to go about interpreting pet food labelling and point out various facts that you may not have thought of along the way. 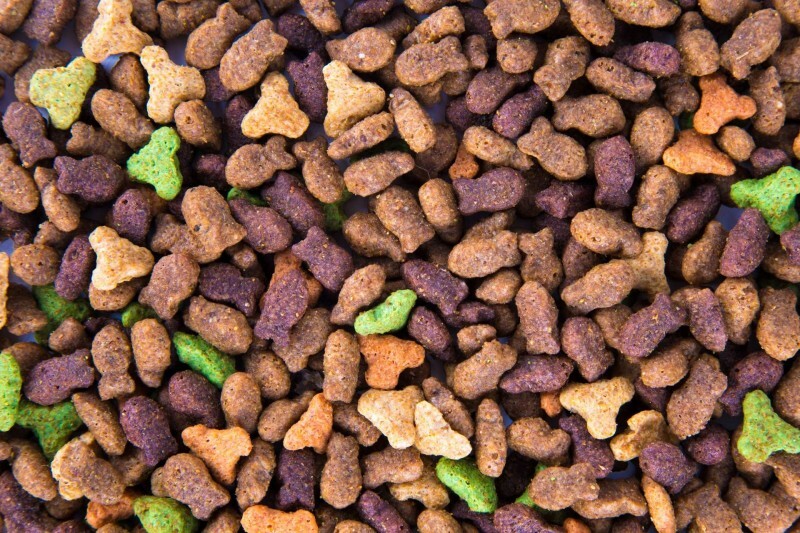 At the end of the day, all pet foods are a set of ingredients, combined in a specific order and way. Just like baking a cake, if you choose inferior ingredients, alter the order in which you combine things, mix up the order of instructions, change the baking temperature or timing, you will end up with something that may not resemble a cake at all! Having a list of ingredients to look at tells you very little about the end result of the food itself. Understanding that it isn’t one or two main ingredients, but instead the sum of all of the parts that makes the recipe appropriate or not, is the first step towards deciding on a food for your pet. Ingredients are listed according to their weight, from heaviest to lightest. These lists can be grossly manipulated; for example you can list a normally dry ingredient in its wet form in order to put it higher on the label. It doesn’t mean there is more of it, just that when wet it weighed more. Looking at the ingredient list will give you no indication of the nutrient value of each individual component – and nutrients are what actually count from a nutritional perspective. Ingredients are simply the vehicle for the nutrients and without nutrient break-downs you cannot verify the quality of a food. Unfortunately, there is minimal regulation on pet food in Canada (and it only pertains to packaging requirements). Because a lot of the pet foods sold in Canada are also available in the US we benefit from them having to meet regulations set forth by AAFCO (Association of American Feed Control Officials). Even then, the AAFCO guidelines are not very thorough and leave a lot of room for less nutritious foods to enter the marketplace based on minimal reporting, standards and the guise of marketing. For this reason, one of the first things I assess with a food is the company making it. I want to know what their standards are. Do they have veterinary nutritionists helping to create their recipes? Do their facilities meet strict quality assurance codes? Are their external sources for ingredients held to the same standards as they keep internally? Do they test every batch of food for consistency and safety? Do they do feeding trials for their foods? Are they investing more money into research of benefits and palatability than they are on marketing? What are their commitments to animal welfare, pet nutrition, ethics and medical advancements through nutrition? We have seen foods that have been independently, scientifically proven to prevent, treat and cure diseases – from kidney disease, to arthritis, to urinary issues – the benefits and capabilities of nutrients are endless! In that same way, we have seen the devastating effects that poor nutrition can have on a pet – from causing diseases (such as urinary and kidney) to making them more prone to medical conditions (like obesity, diabetes and orthopedic abnormalities). Marketing can be mis-leading and truly dangerous for pets as we see gimmicks of all kinds in the pet food world. Promises of ingredients preventing diseases, fancy bundles and bits promising to bring more energy, happiness or flavour, colours and shapes “designed” to increase a pets’ interest in the food; all of these things having no scientific merit or evidence of their claims. As somebody dedicated to advocating for animals, it is disheartening and frustrating when I have to explain to my clients that they may have been duped while trying to choose wisely for their pets. Be aware of the AAFCO statement on your food. You should be able to find it near the ingredient list. There are a few things to note. First, was the nutritional adequacy of the food determined by formulation method or feeding trial. I would like to think that every food that makes it to consumers has been fed to animals first to ensure that the recipe is safe and palatable. I’m not talking about animal research, I’m talking about final stage checks and balances. I don’t think it is appropriate for a food to be on the shelf so that pets at home can be the proverbial guinea pigs. We have seen that play out very badly more than once as pets become ill, veterinarians start reporting the incidents and then a food is recalled. It is dangerous and almost always unnecessary. Some companies have their own methodology for feeding trials to ensure that the foods meet the claims promised on the bag. This is done carefully and with many scientific controls in order to protect the animals in the trial as well as the validity of the outcomes. Adding cranberries and saying “now with cranberries for urinary health” on the bag should not be acceptable… but it is! After determining whether your food has been approved based on formulation method or feeding trial (the AAFCO trial is actually quite small and so I do like when companies also do their own, more extensive, analysis), check and make sure it was tested for pets the same lifestage as your own. Unfortunately, some bags will indicate puppy/kitten, adult or mature/senior on the bag without having an appropriate nutrient profile for that age group. Just like in humans, different ages require different combinations of nutrients. Based on your energy requirements (ie. Are you growing? How active are you? ), you will need different amounts of nutrients and having too much or too little can be detrimental. AAFCO approves foods for puppy/kitten, adult dog/cat and all lifestage, but not for older pets. Don’t ask me why… I’m still trying to figure it out! Most strange to me is the “all lifestage” certification. Knowing that pets in different lifestages have different requirements, AAFCO has decided that they only care about minimums and so – if a food has all of the minimum requirements for that lifestage, the food passes. Of course, we can all attest to the fact that excess nutrients can be bad – just think of fat and protein. That said, an “all lifestage” food must meet the puppy/kitten requirements as they have the highest minimum requirements because they are still growing. If that were not strange enough, you won’t just find the “all lifestage” AAFCO statement on foods labelled for all lifestages, you will also find it on foods that, on the front of the bag, are advertised for adult pets. This means, the nutrients don’t match up to what the adult pet needs. Ensuring your food is approved for the lifestage it is being sold for is an important and necessary step when choosing an appropriate diet. The guaranteed analysis is always confusing and, even on human food, most people spend little time really verifying its merits. On a pet food bag, only the minimum protein and fat, and maximum fiber and moisture are required (as a percentage). This tells you very little about what is actually in the bag. Knowing that there is a minimum 12.0% fat means that there could be 12.0% or there could be 60.0%! These numbers are not helpful without a range and they still cannot tell you whether the nutrients are high quality and useable or not. For example, some companies use ground up bone for their protein source. In theory, this is protein, however the body cannot utilize that protein properly and so the food contains protein but the body is not actually getting any. That example also highlights another important factor – using bone increases the calcium and phosphorus content of the food (as this is what bones are made of). While these are important nutrients, excess amounts of calcium and phosphorus can cause kidney and urinary issues, both dangerous and unnecessary consequences of feeding a poor diet. Poor diets from a nutritional perspective sometimes look phenomenal from a marketing perspective. Many companies speak to the benefits of having “chicken as the first ingredient” or shorter ingredient lists. Of course, neither of these factors speak to the nutritional adequacy of a food – good or bad – those factors cannot help you differentiate. The criticizing of by-products in pet foods is another marketing tactic. As humans we eat by-products all the time – according to the AAFCO Official Publication in 2008, by-products are simply “a secondary product produced in addition to the principal product.” By-products are not necessarily nutritionally inferior and are certainly not necessarily ingredients cast off by the human food industry. For example, Vitamin E is considered a by-product as it is produced when soybeans are processed. In that same way, vegetable oils, beet pulp and tomato pomace are considered by-products as well. Of course, from a protein perspective people worry when they see terminology like “chicken by-product” but they don’t stop to consider that, while organ meats are by-products, they are also some of the most nutrient-rich parts of the animal! The countless references of mom’s across the world making their children eat liver “because it’s good for you” is actually quite accurate! When you see “chicken” versus “chicken meal” it is again about understanding that meal only refers to the moisture content of the chicken (or any other protein). The reason this is so important to know is that you can actually provide much higher nutrient content with one pound of chicken meal than you can with one pound of chicken as the weight of the chicken includes a significant portion of water. The quality of the chicken or chicken meal depends on the source, the company and the quality assurance – again something you cannot tell based on labels or ingredient lists. The last marketing gimmick I want to touch on, because it continues to confuse my clients, is the use of the word ‘holistic’ on pet food packaging. While I recognize it sounds lovely and implies some sort of “whole body” healthy pet food, it actually has no legal definition with respect to pet food which means any manufacturer can use the terminology without meeting any sort of criteria! Recently I was able to spend some time in a pet store staring at pet food labels and trying to understand what my clients go through when they are making decisions. Not only were the bag sizes slightly different, the kcal/cup and cups/bag (remember, different shaped kibble will fill a cup differently) were all variant. The portions were also confusing – one read “if your pet is between 51-90lbs feed 3 – 4 2/3 cups.” I cannot imagine how pet owners actually figure out how much the foods are $/cup in order to actually decide what is expensive or inexpensive. I found two 13kg bags that were both $74.99 but when I calculated how much it would cost to feed a 50lb dog one worked out to $1.72/day while the other was $2.05/day based on the feeding amounts being different. It’s just not apples to apples! I realize that this blog is likely to both educate and confuse you on the topic of pet food labels. Unfortunately, pet food labels are not very helpful when it comes to assessing the quality of the food itself. I would encourage you to bring forward questions you have about your pet’s diet. The Westway Animal Clinic team has ongoing training on veterinary nutrition and specific needs of individual animals. This is a far cry from the qualifications of the majority of pet store employees. It is the difference between retailers (sales people with confident sales pitches about the foods) and health care providers (who will only encourage a pet food purchase once the wellness and medical needs of your pet have been evaluated). As a team, we will work with you to identify whether the food you are feeding is meeting your pet’s individual needs along with your own personal requirements around manufacturing, ingredient sourcing, nutrient values, philosophies and budget. A High-Paw For Our Veterinary Technicians!